Bears We've Met is a compelling collection of short stories of close encounters with bears spanning more than thirty years of the author's experiences in North America's remote regions. In this documentary, the author shares early blunders and tense moments, including humorous and intriguing incidents, as he and his wife confront the largest of land mammals. The book recounts time spent exploring Alaska and Kodiak Island; backpacking along the Appalachian Trail; and hiking within the southern Appalachians, Colorado, and Shenandoah and Yellowstone National Parks. Each story affords the reader the vicarious opportunity to explore a remarkable wilderness area through informative descriptions of the extraordinary landscape and diversity of flora and fauna found within. This book is more than "armchair entertainment" for those interested in the bear as an American wilderness icon. It provides valuable insight to understanding this majestic creature and the vital role it plays in nature as a dominant landscape species. 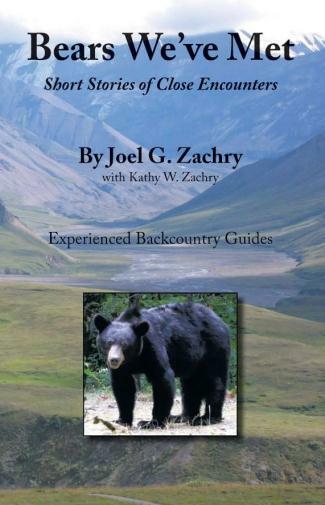 Whether you are one of the participants that Joel and his wife Kathy, have taken into the depths of the Great Smokies; led to Alaska in pursuit of the Last Frontier; or you are new to their adventures, you will delight in their encounters with bears as recalled herein. “It was a sound that I would never forget! From my crouched position I quickly looked in the direction of the noise to see three frightened brown bear cubs reeling backward from no more than ten feet behind me. What brought their roll to a halt would have my life flash before me in the intense moments to follow. The noise was not unlike one made by a car window that is not quite closed - a low, hissing sound. I had moved only feet away from the others in my party who were gathered with me on the bench as I stooped toward the ground to retrieve my camera from the fannypack near my feet. Startled, I rather quickly looked up from a crouched position to my right in the direction of that hissing sound. My eager eyes brought into focus two, maybe three, chocolate fuzzballs dwarfed by an immense adult bear form. Slightly in front of two equally diminutive siblings, a brown bear cub only weeks old had hastily retreated at the sight of me only ten feet away. There followed a comical – but still serious -- domino effect as the two others toppled into the much larger figure behind them. I slowly and cautiously came to an upright position, totally unaware of how the other men, potentially in harm's way, might be reacting to this intense moment. My focus immediately changed from the tiny cubs to the enormous protective mother bear only steps away! She had risen above the bank of the river below the platform. In almost surreal stance, she stood there as all three retreating cubs squealed in fear at their discovery of me and withdrew to her for answers.